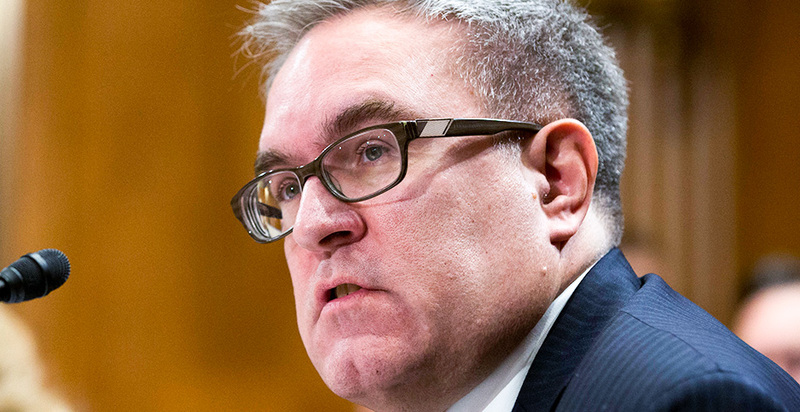 Andrew Wheeler, a former coal lobbyist, is likely to become the first EPA administrator to regulate greenhouse gases from power plants. But few expect him to sign off on a rule that closes coal plants and reduces carbon emissions. One of Wheeler's first regulatory tasks at EPA will be helping the agency complete its overhaul of the Obama administration's Clean Power Plan. The agency appears poised to replace, not repeal, the landmark rule, making it likely that President Trump and Wheeler, a former aide to Sen. Jim Inhofe (R-Okla.), a climate skeptic, will oversee the nation's first-ever climate rules on power plants. Scott Pruitt's resignation from the agency last week came as EPA completes its rollback of the Clean Power Plan, a goal Pruitt pursued since his days as Oklahoma's attorney general. EPA has yet to release a final repeal of the original rule or formally propose a replacement. That leaves it to Wheeler, a former Murray Energy Corp. lobbyist, to finish the job. Some conservatives want Wheeler to scrap the Clean Power Plan altogether, setting up a fierce legal fight over EPA's authority to regulate carbon dioxide. They're urging him to use the opportunity of a second Trump-appointed Supreme Court justice to challenge the agency's endangerment finding on greenhouse gases, the legal underpinning for carbon regulation (Climatewire, July 6). But few legal observers expect Wheeler to heed those pleas. Industry strongly favors replacing the Clean Power Plan with a weaker rule. And overturning the endangerment finding remains a tall task, even with a more conservative Supreme Court, they said. "I think when Pruitt took office, he was not inclined to replace the Clean Power Plan. Virtually everyone in industry thought that was unwise — that EPA did have a legal obligation, but also they would be better off with a rule in place than no rule at all," said Jeff Holmstead, an industry attorney at Bracewell LLP who served as EPA's top air quality official during the George W. Bush administration. "I think Pruitt was persuaded of that. The White House was persuaded of that. And I think Andy feels the same way." The replacement will likely contain several differences from the Obama-era edition. Where EPA had proposed several pathways for reducing carbon emissions under President Obama, including energy efficiency and boosting renewables, the Trump plan is likely to focus solely on improving power plant efficiency. And where emissions reductions were to be spread across the entire power system under the initial Clean Power Plan, the replacement is likely to focus on reducing carbon from individual power plants. "It's consistent with Republican idea of what the Clean Air Act allows," said David Bookbinder, chief counsel at the libertarian Niskanen Center, which has argued in favor of a carbon tax. "It gives the emitters the protection they want. There is a rule in place. They can say, 'We are being regulated.' It might be lenient, forgiving, whatever, but they are being regulated." He added: "It won't do much to reduce emissions, and it will protect industry, so it will be a perfect Trump administration plan." Analysts said EPA will be hard-pressed to find many emissions reductions from existing coal plants by improving their efficiency. Power plant efficiency is often described in terms of a plant's heat rate. The Obama administration initially had hoped heat rate improvements could contribute a 6 percent emissions reduction, though it later reduced that figure to between 2.1 and 4.3 percent, based on the region of the country where the plant is located. Even that modest reduction could be difficult to come by. Fuel is one of the biggest costs in operating a power plant, and the owners of many facilities have already taken steps to get the most bang for their buck. "It will probably be prohibitively expensive to overhaul one of these large plants to get large jumps in efficiency," said Joshua Rhodes, a researcher at the University of Texas. "Maybe there are some tweaks and things someone can do. It's hard once you have all that steel and concrete in the ground." The high cost of further efficiency improvements, coupled with the precarious economics of many coal plants, makes it unlikely that the administration will pursue an aggressive standard, analysts said. "There's not much room between zero-effect standard and a standard that could prove costly to at least some units and thus encourage retirements, so I expect a very minimal standard," said Marc Chupka, an economist who tracks the industry at the Brattle Group. Even if plants do make improvements, the result could be the opposite of the rule's intention. It's possible that the efficiency improvements and replacement of old parts with upgrades could lead to even greater emissions, according to Miles Keogh, executive director of the National Association of Clean Air Agencies. That's because although these improvements could reduce emissions, an aging power plant equipped with new parts could increase the number of hours it is operated annually by being more efficient. That could add years to the life of the plant through the replacement of parts that might otherwise lead the plant to be retired. "They would run cleaner, but run more often, and for longer, so lifetime emissions are worse," Keogh said. He noted that any rule on carbon emissions is less of a threat to coal-fired plants than cheap natural gas. That includes Obama's version. Wheeler's potential plan, sometimes called an inside-the-fence-line approach, would be a blip for plant operators compared with the threat of natural gas, Keogh said. "Some coal-fired plants could be shut down, but gas is out there picking off coal plants left and right. Inside-the-fence-line is a minimus by comparison to the challenges the older plants are facing," Keogh said. While few expect EPA's replacement rule to be stringent, the agency's latest actions to submit a replacement rule suggest the administration recognizes its requirement to control greenhouse gas emissions under the Clean Air Act. Some far-right conservatives had hoped to reverse that. "I think there is a real irony that in order to put forward this rule, this administration is effectively continuing to recognize that climate is a problem," said Ben Longstreth, a senior attorney at the Natural Resources Defense Council. "I'll be very curious whether reductions in climate emissions are discussed in the proposal or not," he added. Power companies have pushed EPA to replace the Clean Power Plan with a looser standard while seeking to stymie efforts to abort the endangerment finding. The Edison Electric Institute, the industry's main trade group, sent a strongly worded letter last year to the conservative American Legislative Exchange Council, saying the industry did not support an attempt to unwind the legal underpinning of carbon regulation. But EEI has supported attempts to replace the Clean Power Plan with a weaker rule. In comments filed with the agency earlier this year, EEI criticized the efficiency improvements called for in Obama's Clean Power Plan. EPA's proposal was based on a flawed study and faulty assumptions about how coal plants operate, the trade group wrote. "Any BSER (best system of emission reduction) determination should not disadvantage sources that have already taken measures to improve efficiency and should take into consideration and reward early actions," EEI wrote. The group went on to argue that "the applicability and potential utility as a means of reducing emissions of any particular HRI (heat rate improvement) measure is a unit-specific assessment that does not lend itself to defensible generalizations and should be considered as part of the state's applicability of BSER to individual units." EPA had previously set a target of eliminating the Clean Power Plan by the end of the year. It's unclear how Pruitt's exit might affect the timing or how much Wheeler might seek to influence the process. Keogh suggested that Wheeler's approach to the Clean Power Plan replacement might change the mechanics of how emissions are cut while maintaining the intent of the rule established by his former boss. "He knows how a public process works; his time with Inhofe means he knows how to do a regulatory process. My sense is the mechanics of the policymaking will be much more cogent," Keogh said.